The smash success of the current revival of Doctor Who in the UK begs the question when the good Doc may hit the silver screen. Many people don't realize that in fact, Doctor Who has already been in the cinema twice in the mid 60's. 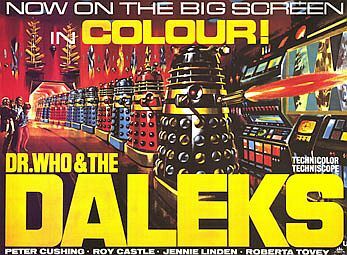 In the height of Dalekmania, Amicus Productions (a sort of stepbrother to Hammer Films) brought the Daleks to life in Technicolor and Techniscope. Amicus fiddled with many of the basic concepts of the original black and white series (the Doctor's surname is actually "Who" - an earthman inventor who is taking his time machine on its maiden voyage, etc. ), excluding the films from the elaborate series canon. The first film was based on the first Dalek TV story, tightened up and laden with costly action. The follow-up film was unsurprisingly based on the second TV appearance of Daleks, but was not nearly as successful as the original movie. The option for a third movie was never picked up. Many Who fans either don't know about the films, or ignore them entirely. Then again I've also met people who only know Doctor Who through the features films, and are only dimly aware of the 28 year old series that they were based on. The movies are kiddie fare, but it does show you the kind of menace the Daleks are capable of trundling around in wide screen color. The plot changes from the source material are a bit annoying, but necessary in standalone films aimed at a young audience. 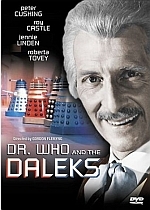 DVD of "Doctor Who and the Daleks"
DVD Sequel "Daleks - Invasion Earth"